All of our turbocharging compliment the best in performance turbocharging today! Turbonetics Precision, and Garrett Turbochargers, the pioneer in performance turbocharging! With the knowledge and experience of one some of the best names in turbocharging, Treadstone products parallels with quality and reliability, giving you the best products combination in performance turbocharging. With a no hassle one year warranty that cant be beat! We are passionate about Subaru performance, and we stopped at nothing to make this one of the best kits available to the enthusiast. With many different turbo options, from standard bearing, to ceramic ball bearing, to the GTK turbocharger, performance options are endless whether your tuning for street, track or strip. We can custom build a turbocharger to your specs, with turbine wheel size, turbine AR, compressor AR and compressor trim. Boost pressure is regulated by a Tial 44mm V band wastegate, combined with our double slip fit dump tube, installation is quite simple, compared to other kits on the market kits. Our stainless is made in the USA and hand welded to perfection, utilizing top notch quality parts throughout! Precision billet wheel turbochargers are now available! Included with your rotated turbo kit set up is a cold air intake kit available in 4 color options. Suby blue, murdered out black, crinkle red and polished. Features a 3" aluminum mandrel bend for smooth air flow into the turbo. Precision welded MAF adapter engineered to perform, and placed downward of 6" of straight tubing for laminar flow through sensor. No erratic idling, or faulty readings, we tested and tuned this intake to run perfect. With a 3" inlet pipe you have greater tune ability to run larger injectors and meter larger amounts of air for high horsepower levels. Includes a large 8" long K&N air filter for the least restricted air flow into the turbo. Also, available is an upgraded big MAF tube for horsepower levels above 550hp, super tunability with the big MAF intake kit. Our larger 3.5" Cold air intake supports up to 550 to 900hp with ease. The larger cross section at the MAF metering point gives you great tunnability for larger injectors and more effective air flow metering at higher horsepower levels! All of our stainless steel is hand crafted in the USA using USA made Rath 304 stainless steel, and hand tig welded to perfection. The up-pipe utilizes a 2" pipe with CNC precision cut stainless flange, and bolts directly to the factory exhaust manifold. The Tial 44mm wastegate is positioned perfectly to allow smooth exhaust flow into the wastegate for precise boost control eliminating boost spikes and creep. The downpipe utilizes 3" diameter tubing. 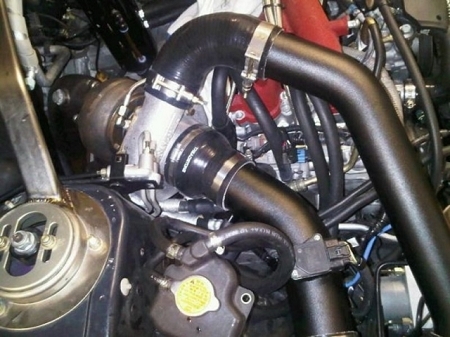 The large diameter dump tube is routed far down from the turbo outlet to further eliminate creep and spikes, as well as making more power be decreasing back pressure in your downpipe enhancing turbo spool up, and increasing wastegate efficiency. The dump tube has 2 slip fit joints which makes turbo installation much easier than most other kits on the market, no hard to reach flanges, or clamps. And your able to change remove the downpipe, turbo or wastegate with out taking out the whole system. The downpipe will bolt up to any aftermarket or OEM cat back exhaust system. Please NoteWe will size the turbo for your needs, weather its Track use, drag use, street use, or a little of both. Turbochargers will come water cooled utilizing the factory waterlines. Turbo trim and AR options are endless. Please contact us for more info. 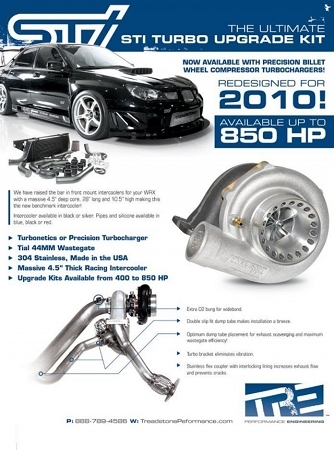 Below are some of the most popular turbos that we sell with this turbo kit. 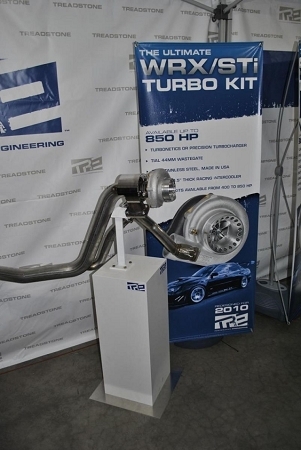 The kit will be offered with various turbochargers from different manufactures. We manufactured our kit around a T3 T31 4 bolt outlet. This is available from Turbonetics, Garrett, and Precision. We are now leaving this up to the end user to purchase the turbo that they choose. The Turbonetics 50 trim T3/T4E, Garrett 50 or 57 trim, GTK450, Precision 5557, and the Garrett GT3076 are all in the same family of sizing. Good for around 400whp on pump and up to 500 on race gass. The next size up would be the GTK500 and 550 or T61mm, Precision 6262, and the Garrett GT3582. This family is good for 400whp on up to 600whp. The next size up would be for drag racers, Garrett GT40, Precision 6765, and Turbonetics T66 and 72. 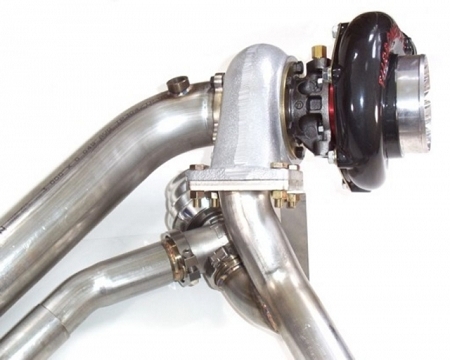 All these turbos are able to adapt to our kit utilizing a T3 T31 turbine housing.